Don’t call the Sierra Club. The wood we chop isn’t for building or heating. 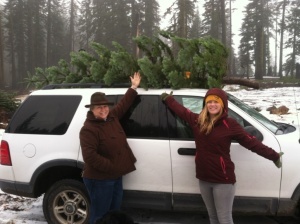 We are Christmas tree hunters—amateur lumberjacks that thin the forest one tree at a time. The permit costs $10 but getting lost is free. We never hunt alone. Deep snow, poorly marked roads, and ruddy driving conditions usually make for an unforgettable outing. For twenty winters I’ve hunted with Steve, a friend who will give you his back and the shirt to go with it. Steve hunts deer, elk, ducks—any animal that flees or flies. He’s a woodsy guy but seldom bags prey. Not because he’s choosy, but because he’s a lousy shot. Steve hikes miles searching for game and re-hikes different trails, often empty-handed, looking for his truck. Trees are easier to catch. I awake at sunrise and scramble eggs for Hun and the kids. While they make lunch I toss a tow strap, shovel, and extra jackets inside the SUV. Then we tank up on hot chocolate before heading 40 miles east for that elusive silvertip. We pulled into Steve’s driveway at nine. 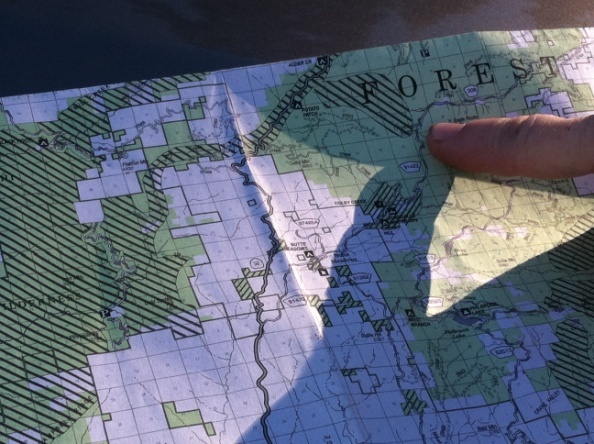 The drive to the Lost Meadows Ranger Station curves through dense cedar and pine forests. A convoy of pick-up trucks usually beats us but the parking lot was empty when we arrived. Steve and I met with a ranger. We drooled at the prospect of four-wheeling. With four-wheel-drive we can drive twice as far as two-wheel-drive before getting stuck. We both try to avoid trouble but often get into it together. Upon our arrival at Crooked Gulch the weather chilled. Snowflakes melted on the windshield while the wipers screeched over the glass. Hun and the kids rubbed their hands around the Ford’s defroster. 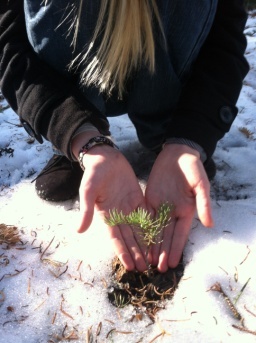 Christmas tree selection tests personal preferences, like Goldilocks tasting porridge. The tree can’t be too short, too tall, too bent, too bushy, or too sparse. The time spent tree hunting is directly proportional to temperature, snow depth, and whoever needs to go to the bathroom first. One blustery day my crew found the perfect tree without unfastening their seatbelts. We tree hunters stay away from trees along roadsides, camps, trails and streams and don’t cut trees with trunks larger than six inches. 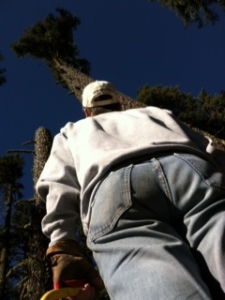 And we know better than to fool with trees that host spotted owls, bears, or deer stands. The tree we pick is always the right one. Trees are beautiful in their natural state but look different atop an SUV. Trees are long. We usually find one that barely hangs over the windshield. Sap and windshields, like Canada Geese, mate for life. After hunting, our tradition is to admire our catch and relax with food and drink. Then caravan home where the hard work begins. We set the tree outside in a bucket of water then rearrange furniture and test Christmas lights before bringing it inside. Those chores can last a week. 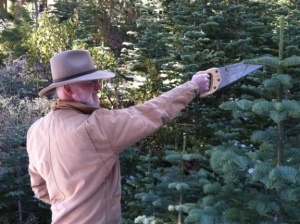 Christmas trees are grown in all 50 states and nearly 18% of Americans reportedly cut their own. I’ve never wandered into Hawaii—the Pacific Ocean blocks me—but Steve makes sure I never leave the Sierra Nevada. The college years are approaching and one day my kids won’t be around to enjoy this tradition. Traditionally, I guess that’s how it goes. Kids eventually grow up, move away, and start their own traditions. I enjoy spending time in the woods and hope to continue future Christmas tree hunts with Hun. I’ll rare to go, rain, snow, or shine. And even if I won the lottery and bought my own forest, I’d still go with Steve. It’s tradition. Be sure to join the Etc. Guy Facebook page and LIKE it. Copies of my book “Let Me Tell You a Story” are available at Lyon Books in downtown Chico, and also at Amazon. Or send me a note at eric@etcguy.com.